During the Wicomicon event, The Doctor spoke to Uraeus, Creative Director of Black Heroes Matter and Keith Chow, Founder and Editor of Nerds of Color about organizing a one day convention in less than 7 days as well as their creative ventures.&nbsp; Uraeus discusses an upcoming superhero television series they have in the work featuring Black women, while Keith discusses the advocacy efforts his network engages in to assist Puerto Rican citizens still suffering the effects of last year's hurricane. 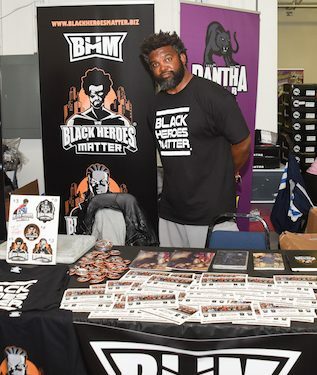 During the Wicomicon event, The Doctor spoke to Uraeus, Creative Director of Black Heroes Matter and Keith Chow, Founder and Editor of Nerds of Color about organizing a one day convention in less than 7 days as well as their creative ventures. Uraeus discusses an upcoming superhero television series they have in the work featuring Black women, while Keith discusses the advocacy efforts his network engages in to assist Puerto Rican citizens still suffering the effects of last year's hurricane.